Happy birthday baby! Today is your first birthday, but we have been celebrating and remembering you for 2 days. So many people love you and are honoring you! My fellow baby loss moms from all around the world lit candles and thought of you last night. Yesterday we celebrated your birthday at Grandma & Grandpa Neaus. Lisa and her kids, Laura and Dan, as well as Tim and Sarah were all there. We got balloons and wrote messages to you on them. We aren’t sure if we wanna try to release them into the sky, or keep them in your scrapbook. I think Daddy really wants to keep them. 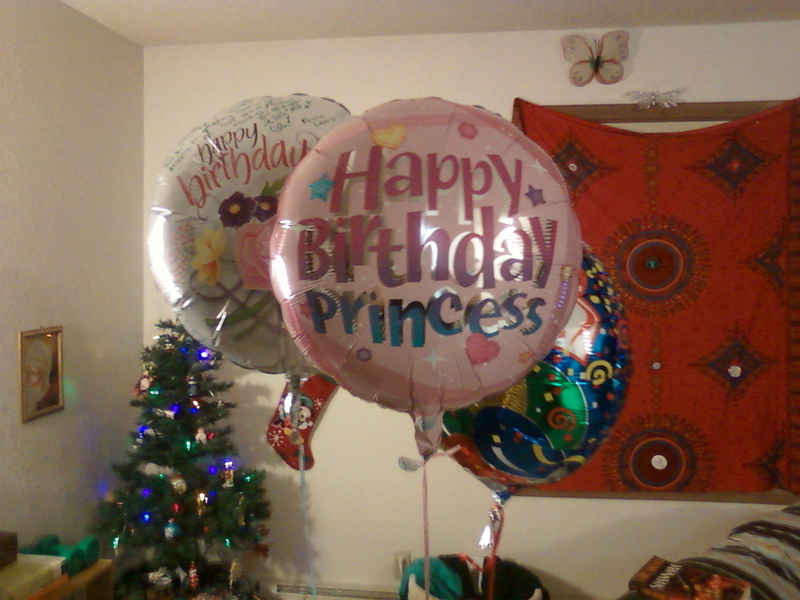 Besides, it is so cold outside that the balloons shrink when they are exposed. I made a devil’s food cake with milk chocolate frosting. Everyone loved it and ate it up quickly. I’m not sure what Grandma and Grandpa B (my parents) are doing for your birthday. Grandma has a really hard time talking about you. But they do have your footprints in a frame with your name and date. I colored part of my hair bright pink for your special day. It matches the robe I got for Christmas! So today it’s just Daddy and I at home. We are burning candles bright in your room. We have come a long way this year. We still cry and feel sad sometimes, but we also feel blessed to be your parents. We know you can see us and hope you are proud. Of course, we both wish we could go back in time and save your life. I think we will always wish for that. I just try to remember: you were made from love, all you ever knew was love. I try to find comfort in that. Happy birthday honey! Hope you are having a great celebration, wherever you are. Love to you, Grace’s Mama and Dad.